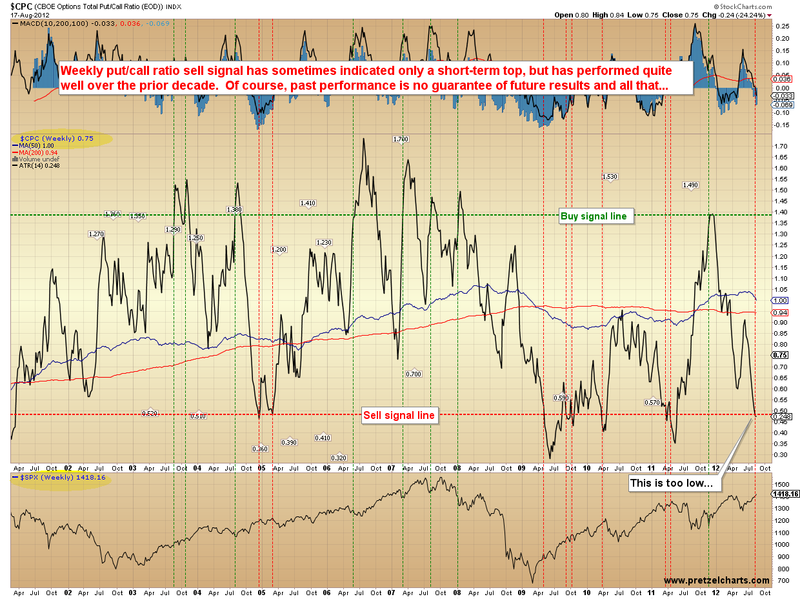 The bottom line with this market right now: there are plenty of sell signals, but price is not yet showing any weakness. I can't overstate how challenging this is making the work of projecting the market's next move right now. Since the number of sell signals is actually increasing as price strengthens, somebody's lying. Either the signals are lying, or the rally is. These signals began firing off after the S&P 500 (SPX) reached 1407, so for the moment, I'm continuing to run with the outlook that the rally is not going too much higher. Since the SPX reached the 1325 swing low in early July, my preferred short-term outlooks have, for the most part, managed to anticipate higher prices when appropriate, and thus have captured the majority of this rally to date. Right now, I'm working overtime trying to decipher this market, because I don't want readers to miss out if the sell signals are actually the liars and the rally ends up growing legs from here. All investing is simply speculation -- and as always with the game of speculation, we are dealing only with odds and potentials. The signals suggest the odds are above average for a top to occur soon (in terms of price), and my research suggests that the current price zone would make an excellent potential turning point -- so, from an intermediate standpoint, I remain cautiously bearish at the moment. Let's discuss why. 1. The Nasdaq total volume ratio to NYSE total volume has finally backed down from it recent all-time high reading of 3.24, registered on August 16. On August 17, it dropped to 2.4, leaving a nice spike high in its wake -- which is often a good sell signal in and of itself. 2. The VIX:VXN ratio has now reached a new low of .73, the second lowest reading of all time. I mentioned this indicator on August 14, when it was at .76. The all-time low of .71 was recorded in March 2012, slightly ahead of the SPX print high which rolled into a 10% decline this past spring. 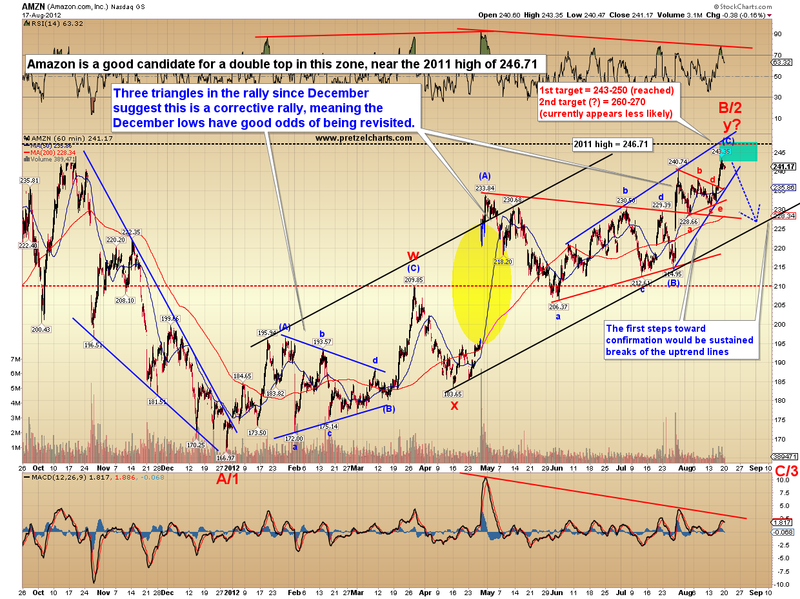 Additionally, there are some new signals to examine. 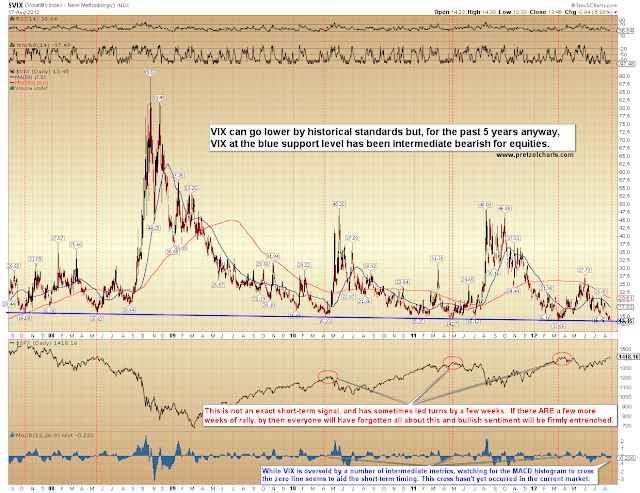 The first is a 5-year chart of the Volatility Index (VIX), which has reached an important support line. This current support level in VIX has marked five consecutive intermediate tops in SPX, going back to 2007 -- though it has sometimes led the turn by a few weeks (which would seem like an eternity in this market). 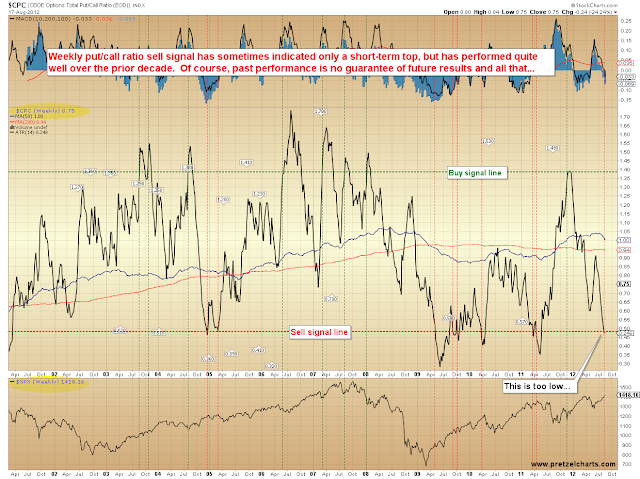 The next chart examines some signals in the put/call ratio (CPC), which also works as a sentiment indicator. For new traders, the concept of tracking (and betting against) sentiment is called "contrarian investing." The basic idea is that stocks are driven by the simple concept of supply and demand, and the more investors are bullish, the less buyers are left in the market. Conversely, the more investors who are bearish, the less sellers remain. No buyers = falling market; no sellers = rising market. This chart below is based on my own buy/sell signal indicators, which I've structured around the weekly put/call ratio. This chart reveals a decade of prior history for this indicator, and one can examine the chart and see that a cross of the sell signal line (represented by the dashed red vertical lines) almost always triggers an equities correction at the minimum. 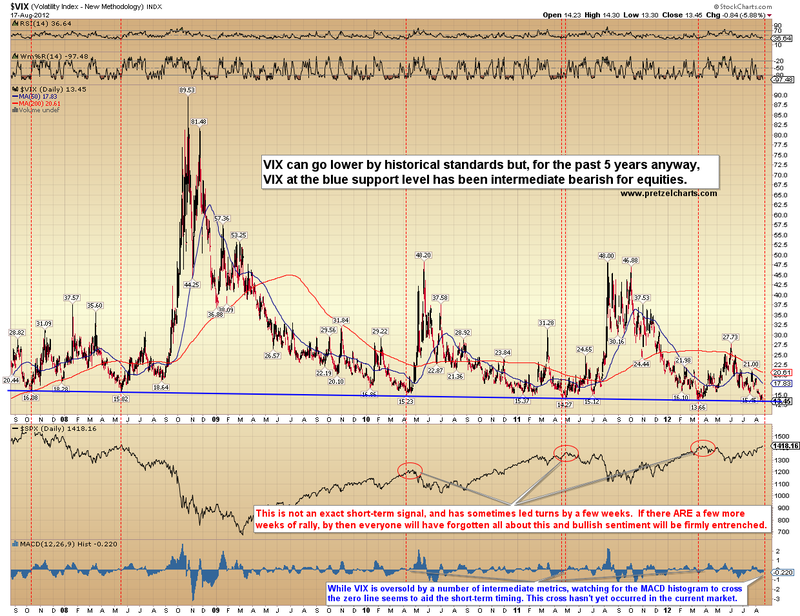 Note that, unlike the VIX chart shown above, this is not necessarily an intermediate sell signal. However I felt it was worth sharing, because the current put/call readings, just like the VIX readings, indicate there are high levels of bullish sentiment present in the market. Past performance is never a guarantee of future results, and bulls will feel brilliant if all the sell signals fail -- but I am currently unable to bring myself to become "brilliant" enough to ignore market precedent. Combined with the potential of a double top near 1422, which I'll discuss in more detail shortly, I think one has to heed these warnings. Last week, the Russell 2000 (RUT) crossed my bullish buy trigger at 808.53 (this has been a standing buy trigger for several weeks), and on Friday it easily captured the trigger's 818-820 target. The larger pattern here is still a mess, and almost impossible to decipher at the moment. Now that the short-term target has been captured, I simply have to take a "wait and see" approach to this chart; two trendlines are noted which may help with short-term direction. 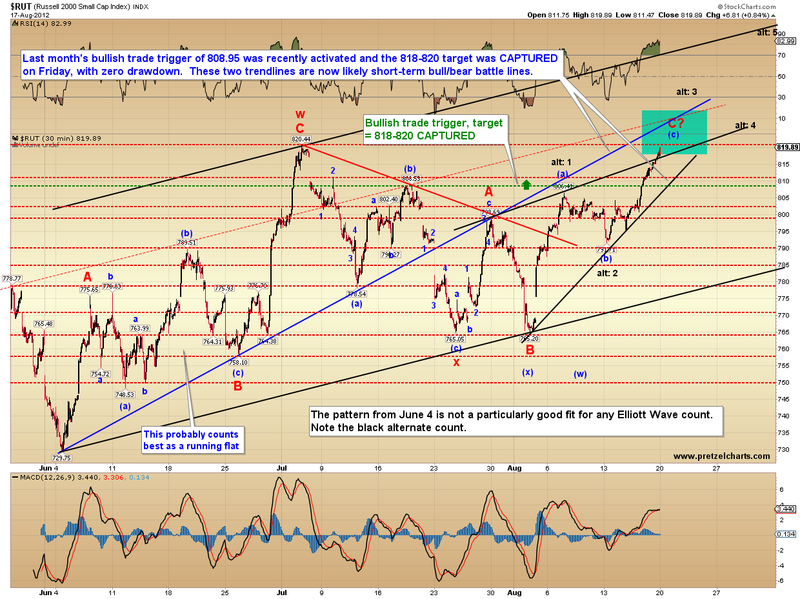 The S&P 500 (SPX) has also rallied into the short-term target zone, and is another messy chart. Both SPX and RUT continue to look like corrective rallies since June, which suggests that lower prices will be the ultimate outcome -- but as mentioned, price has been reaching upside targets, and has not shown any weakness so far. 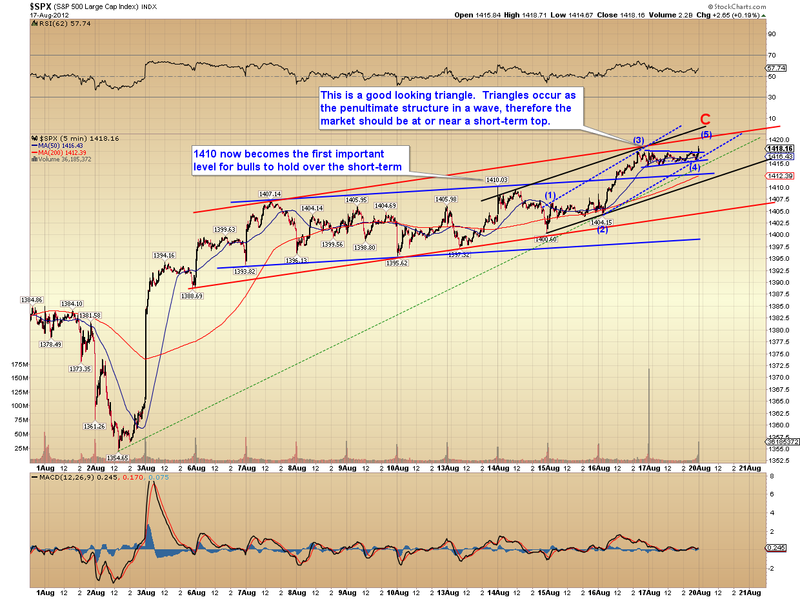 A short-term chart of the SPX reveals that this rally leg has good odds of wrapping up soon. The appearance of a triangle in the fourth wave position helps confirm that the up-thrust is nearing completion. A weekly chart of SPX reveals the potential for a double-top. 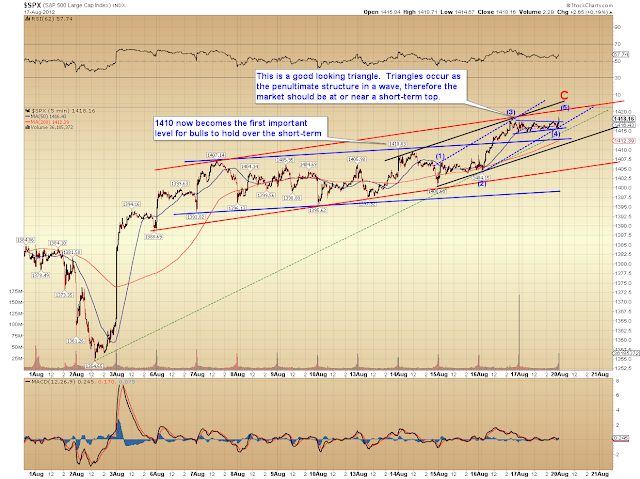 On July 3, I asked whether the market needed to retest the 1422 zone, and the market has since answered. Now the question of course becomes how the market will respond to this retest of the prior highs. Since I'm discussing the double top pattern, it's relevant to outline exactly what that pattern is. It's also important to understand the difference between a double top, and a pattern that has the potential to become a double top. I've been attempting to remain cognizant of the fact that the experience level of my readers varies significantly, so I hope the veterans will forgive me for stating the obvious here: Right now, this pattern is a potential. So what are we looking for to help confirm or rule out a double top? First off, a "double top" does not need to be to-the-point on price; so (similar to the term "retest") it's more of a zone that ranges slightly above and beneath the previous high. The majority of technical analysts consider this zone to be plus or minus 3% of the previous high; note on the chart below that the 2000 peak was a lower high, but 2007 was a higher high. Another confirming factor for the double-top pattern is volume: volume should generally be higher on the first leg up than on the second leg, and so far that's been the case here. The corrective appearance of the rally suggests that odds are above average for a double top, but as always, we'll need to see how the market responds to determine if the pattern has validity. 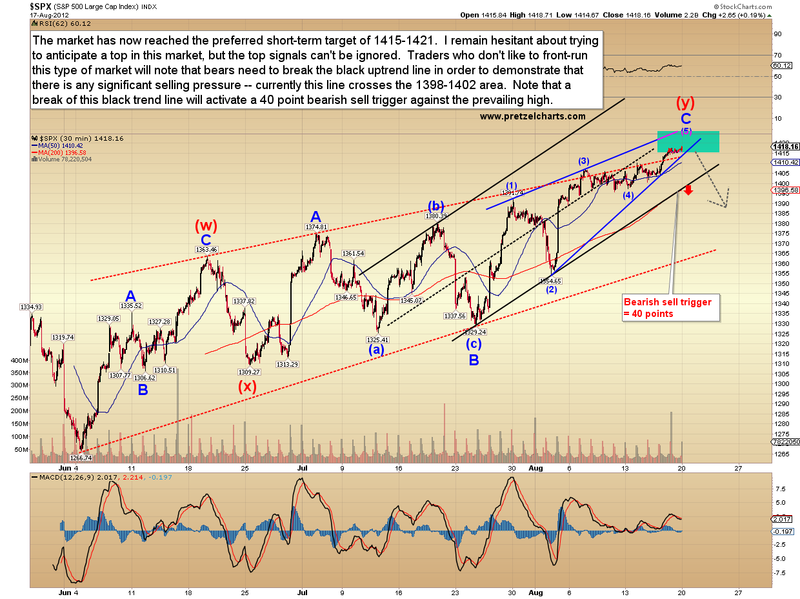 The first step would be a solid reversal coming from within 3% of the 1422 print high. In classic technical analysis, the pattern is not considered to be "confirmed" until 1266 is broken (and ideally, retested from below); which illustrates one reason I don't rely solely on classic TA. Looking down the road, if bulls can break out of the possible intermediate double top, the next challenge they'll run into is the potential for an ominous long-term triple top in the 1500's. Next is a chart of Amazon (AMZN), and I'm calling attention to it because the present appearance of the price structure on this chart makes Amazon an excellent candidate for a potential double top. 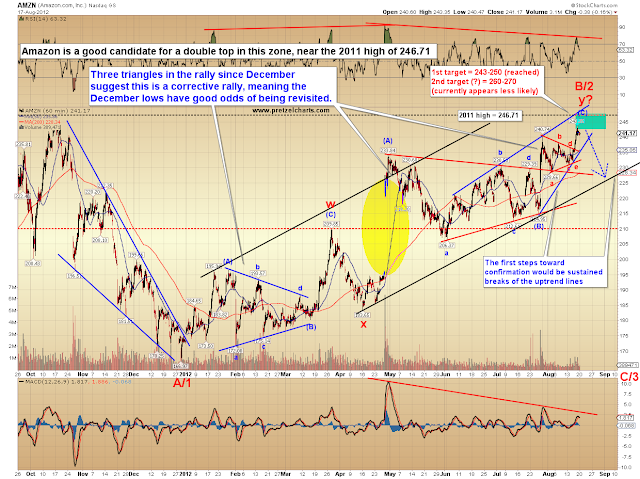 The rally since December appears very corrective. 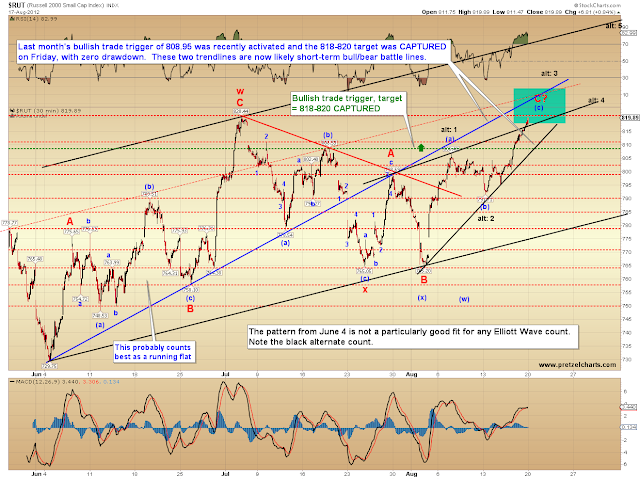 Finally, I want to share a proprietary chart courtesy of my friend Lee Adler at the Wall Street Examiner. The chart is pretty self-explanatory, and I find it intriguing. Fed cash to Primary Dealers has basically tripled since 2007, and this herculean effort has almost bought the market back up to the 2007 highs. The chart seems to illustrate the diminishing returns of each successive QE program, and the question this chart begs is: where would the market be today if left to its own devices? In conclusion, prices are still in the projected turn zone, and the number of sell signals is increasing as prices seem to strengthen. 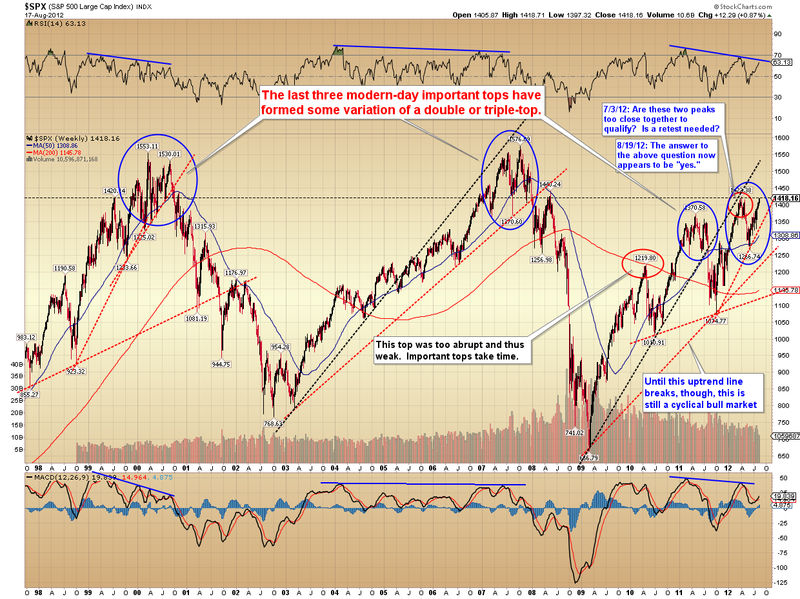 As I stated several weeks ago, this type of top is a process, not an event. If the overall outlook is correct, then that process should be approaching completion in terms of price, if not time -- and, assuming the sell signals aren't lying, then we should see some price confirmation relatively soon. The bottom line is: if this turn is going to happen, then we should be pretty much "there." Trade safe.